Generally clear skies. Low 56F. Winds NNW at 5 to 10 mph..
Is this the end of the Kings Drive-In? ARMONA — For many people, the Kings Drive-In Theatre brings back nostalgic memories of movies flickering in the dark through car windshields. They don’t know what Geraldine Graff does. Every morning, the owner of the facility cleans up from the night before. She doesn’t like what she sees. Graff encounters vandalism she says is threatening to close the historic theater down. Hoodlums damaged the exit gate, ripping out wires and cutting a hole in it. Graffiti mars the inside and the outside. Someone tore up the metal fence at the back in order to watch movies for free. Others ripped four doors off the women’s restroom. Toilet paper dispensers were removed. They keep taking down signs that Graff puts up. They even stole a wooden plank off an outdoor seat in front of the viewing booth. Security guards could probably stop the mayhem, but the theater isn’t pulling in enough revenue to hire security, Graff said. The upshot? 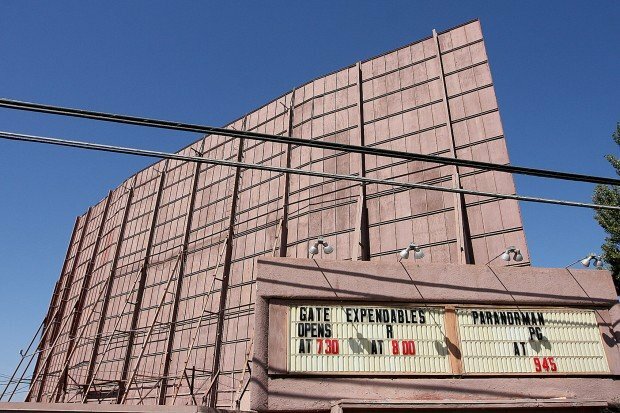 One of the last drive-in theaters in the San Joaquin Valley, one that has been open in Kings County since World War II, could be in its last movie season. During the theater’s traditional winter shutdown, Graff said she’ll be thinking about closing the whole operation for good. 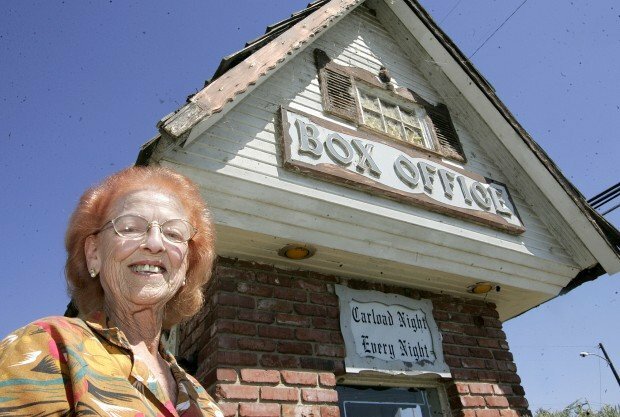 It would be the end of an era not only for Kings County, but also for the Graff family, which has operated the outdoor movie house through ups and downs since the 1970s. The most recent down was the death of Graff’s husband, Thomas, in 2010. Thomas Graff flirted with selling the property in 2008, knowing he could fetch millions for the prime real estate at 14th Avenue and Lacey Boulevard, a major road crossing halfway between Hanford and Lemoore. Graff predicted it was just a matter of time before he sold. But after he died, his family didn’t want to pull the trigger, instead working to keep it alive. For a time, it seemed like it might work. The economic crash led to a surge in customers. Real estate values also took a nose dive, lowering the property’s value. Now, with the economy and the housing market creeping back, Graff is wondering if the time has come. “It’s just one thing after another, and it gets really annoying,” she said. If she raises prices, she knows she’ll probably lose her main clientele — poor families who don’t have $60 a week to see a movie. At $8 a car for six people to watch a doubleheader, Kings Drive-In is far and away the cheapest game in town. But Graff also has nostalgia customers that come to relive the drive-in’s glory days. Some of them, without Graff’s knowledge, started a Facebook page on Monday called “Save The Kings Drive In Theatre.” Viewership exploded. By Wednesday morning, the site had 2,093 likes and hundreds of favorable comments asking people to donate money to keep the theater going. Graff doesn’t know where it’s all headed. But she’s weary and she’s considering throwing in the towel. “It all depends what happens during the winter on what we are going to do,” she said. The reporter can be reached at 583-2432 or snidever@HanfordSentinel.com. Since the HSR will be adopting the Western Alternative that hits right at 13th & Lacey, 14th & Lacey would be a perfect location for In-n-Out! Yes, we all have wonderful memories of the Drive-In. But it's time has come. Probably 50 of those 2,000+ "liking" people on Facebook have been to the Drive-In in the last 20 years, and they're not going to support it in the future. Cut your losses now, Mrs. Graff. How can people volunteer to help keep the drive in going? What do you need? Allow those that volunteer to a free movie. I have been going to the drive-in for over 20 years. I have noticed that over time, the customer base has become more and more disrespectful. I think if you raised the rates just a little, this may help with reducing individuals looking for a cheap hang out to drink or cause trouble. I would love to volunteer and help Mrs. Graff with repairs. The Kings Drive-In is a historic part of Kings County. A part worth saving! Mrs. Graff please contact me via email. I will help! The drive-in has been in a run-down state of disrepair for the past decade (at minimum), so this is not a new problem. I would hate to see the Kings Drive-In shut down because I had lots of fun there as a kid, but it seems like the owner doesn't have the resources (or the desire, understandably) to make this business live up to it's potential, and I can only hope that she will at least sell it to someone who is better suited to give the theater the breath of life it so desperately needs. first off , in n out will never come to hanford. The last time that was tried , the one owner of all the mcdonalds in hanford went whining and crying to the city council and was successful in shooting down the plan. secondly , i cannot stand the one group of troublemakers that always damage and ruin things whereever they are and whereever they move to. Sorry to say but all this damage is caused by mexican kids who have a lust for damaging other peoples property. Its true , you all know it is. To bad people can't respect private property. It always seems to be the same demographic of people doing all the vandalism and graffiti. The drive in is a great place for entertainment and I would pay more per car load to keep it opened. Is there a way people can donate funds to repair the damages these people have caused. I like the idea of a volunteer program to help repair and fix the Drive Inn up. Close it down or sell, sell, sell! Current owners TOO old for upkeep and headaches. SELL to a young energetic couple with new ideas. Needs lots of work, landscaping, building maintenance, remodeling, new screen for sure, security, etc. etc. etc., I go to the REDBOX. Shut it down. Cut your losses with this community, 95% aren't worth your time or effort, Get some money. This area is a cesspool of crime. This area doesn't deserve such a rare gem. People vandalizing property just for the fun of it. We live in a completely different era with completely different people with completely different values than when the theatre first opened. It's no longer a place for families or a place for a date night. It's a dumping ground for vandals who have no interest in watching movies. It's cheap and it gets the teens out of the house for a few hours. Close it. Also, this article is horribly written. I strongly agree with voyager829 when it comes to vandalism. It always seems like it's the Hispanic youth who have nothing better to do than to form gangs and vandalism private property. I have seen the damage first hand the other night at the drive inn and it's all Spanish graffiti! It this vandalism does not stop, then throw in the towel and thank you for the great times! It's great affordable family entertainment and it should be protected from these kids! My family supports the drive inn and will continue to do so as long as there open. Redbox rules, rednecks wreck things. Its the anglo guys messing things at this run-down movie theather. Sell, sell, sell. Plant some more cotton. Blue is a better color. I agree with alot of people that you should not shut it down,Iv'e been going to the drive since the 70's. Ihad alot of fun there and i'll tell you I done my share of partying there but not once did I disrespect the property,.I would be willing to help out to bring the drive in back to life. One more thing that can be done to help in the off season, and we already pay for with taxes is to take the kids that do wrong go out there and do fixing up and repairs that needs done for community service.